To register for UbuntuNet-Connect 2015, you need to create a User Account. You will receive an email to confirm your email address. After confirmation, you will be redirected to the registration form after login. Check, the email may go to your Spam folder. UbuntuNet-Connect is the Annual Conference of UbuntuNet Alliance that focuses on research and education networking activities in Africa. It is organized by UbuntuNet Alliance and hosted by member NRENs. The Conference brings together practitioners in the research and education networking community, researchers, policy makers, academicians, connectivity providers, and a pool of expertise from across Africa and beyond. In previous years, the conference has attracted sponsorship from leading commercial companies and service providers. 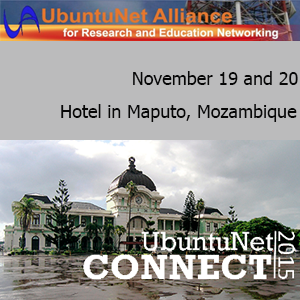 UbuntuNet-Connect 2015 will be held at VIP Hotel in Maputo, Mozambique on 19-20 November 2015 and will be precedeed by a series of other pre-conference events from 16-18 November 2015. The events will be hosted by Mozambique Research and Education Network (MoRENet), the NREN of Mozambique. The annual networking conference and pre-conference events provides opportunities for people with special and common interests to share their experiences, ideas and plans in the light of research and education networking and applications. Proceedings and report of previous conferences are available under ISSN 2223-7062. The conference also provides great sponsorship opportunities for commercial companies who get meet the research and education networking community in one place. For further information and sponsorship opportunities, contact info@ubuntunet.net.